Dimpled and Slotted for Maximum performance! 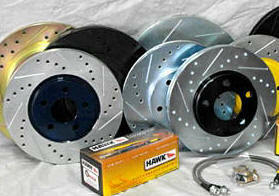 High Performance Slotted and Dimpled Centrex Rotors. Includes 2 Rotors for the Front wheel brakes. 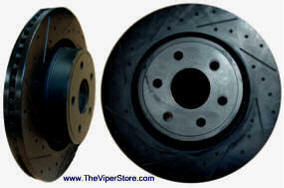 Heat is the mortal enemy of your brake system. Every time you tap the pedal, friction sends the temperature of your discs sky-high. It's even worse during spirited driving, emergency halts, and stop-and-go traffic. 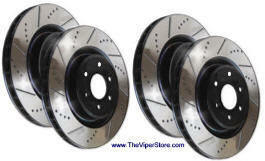 Keeping your discs cool as cucumbers is essential for optimal braking performance, and that's exactly what your High Performance Sport car Rotors do. The secret behind the High Performance Sport car Rotor's cooling powers is simple: wide-mouth slots. Like fans, these grooves draw air over the rotor's surface to chill the discs. Plus, dirt, grime and dust pass through these slots out to the rotor's edge. And, a cleaner rotor means you get even pad wear, extended durability, and better looks. 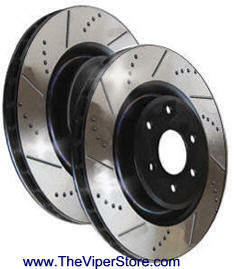 To block brake fade, your Sport car Brakes sport precision dimples. They breakdown brake gases for firm pedal response. What's more, the gold or black anodized-zinc coating fights off surface rust and adds Grand Prix-inspired style to your rotors. Optional: Choose your color for center hat. 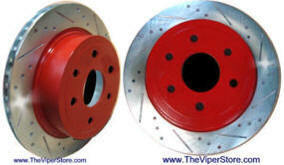 High Performance Slotted and Dimpled Rotors. Includes 2 Rotors for the Rear wheel brakes. 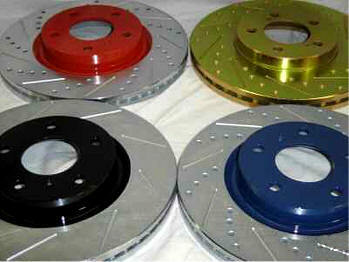 Complete set of High Performance Slotted and Dimpled Brake Rotors. Two for the front and two for the Rear. Low Dust - means Clean Wheels! 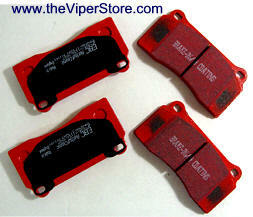 All EBC Red Stuff Brake Pads feature a center-line slot that vents heat and gas to prevent thermal cracks and fade. EBC backs your Red Stuff Brake Pads with a 6-month/5,000 mile warranty. The streets are made for more than just commuting. All that pavement laid out in front of your hood is an open invitation to red-line your speedy auto. Staying in complete control of your high-octane ride is essential in this environment, and that’s why you need EBC’s Red Stuff Brake Pads. The ceramic blend in these performance pads is made special for muscle cars, swift European autos, and other mean street machines. In fact, they’ve been shown to stop sports cars up to 42 feet ahead of OEM pads! Your EBC Red Stuff Brake Pads bite hard, but they don’t leave behind nasty dust residue like other high-performance parts—50% less dust, in fact. And, you won’t hear them screaming bloody murder when you hit the brakes. Their beveled edges, center-line slot, and ceramic mixture keeps the noise down to a minimum. And, you won’t hear them screaming bloody murder when you hit the brakes. Their beveled edges, center-line slot, and ceramic mixture keeps the noise down to a minimum. Upgrade your stopping power with the added control provided by StopTech Stainless Steel Brake Line Kits. Overtime, your old stock flex lines can expand, which leads to decreased response time and a softer pedal feel. 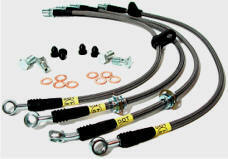 By upgrading to StopTech brake lines you get the improved feel and responsiveness that you have been missing. StopTech Stainless Steel Brake Line Kits are constructed with a Teflon inner line that resists expansion under pressure and will not degrade from exposure to brake fluid. Plus, your StopTech Stainless Steel Brake Line Kit features a stainless steel braid that supports the Teflon and protects against incidental impact and abrasion. On top of this, StopTech adds a clear abrasion resistant cover, so you get impressive protection against chaffing. If buying for ACR call in for special order and pricing.